Image credit © Jojo Moreschi, 2018. I’m welcoming Tom Vowler to the blog today. Tom is the author of short story collection, The Method, novels What Lies Within and That Dark Remembered Day and is here to talk about his latest story collection, Dazzling the Gods, which I reviewed for Wales Arts Review. Tom, you travel from Ireland to Paris, the Gaza Strip, from London to Lucca in Tuscany, and around the coast, woodland and countryside nearer to home in this collection. Is place the starting point for you when writing? Place can be a way into a story, yes, certainly the Paris fiction came after a visit to the Musée d’Orsay. I’m generally compelled to give the reader a ‘felt’ world, to ground and immerse themselves in, place often functioning more than just allegory or aesthetic, but as character itself, to take on meaning beyond its physicality. Proust spoke of landscape having four dimensions, the fourth being time, the places we inhabit having not just a present but a past and future. Characters must never be merely inhabitants of a place but products of it. As I was reading, I noticed that lives and loves not fulfilling their potential is a recurring theme, with childlessness especially noticeable throughout the collection. Was this something that you wanted to explore in particular? Theme, for me at least, tends to emerge unconsciously, and I’m often unaware of such patterns throughout a collection until they’re highlighted by a reader. I suppose it’s hard to ever fully escape the primordial swamp of our psyche, and the short story more than most forms concerns itself with human truths more than escapism. And people who do fulfil their potential are generally dull, I find. I hadn’t realised the prevalence of childlessness running like a seam through the collection. Oh the delight a psychoanalyst could take in trawling an author’s oeuvre. In Lucca: Last Days of a Marriage, an editor works on a late author’s manuscript, someone who “troubled his sentences into existence, cared for them as one might a prized possession or one’s child.” Is this how you’d describe what you do as a writer? How would you explain it? Very meta that story, probably too much so. I was drawn to the idea of a posthumous edit, how you might finish a manuscript for an author without demeaning it. The editor in question wrestles with this almost unreasonable task, to both second guess the author’s intentions and to remain consistent to the aesthetic course charted. Sometimes all I need to nudge me into reading a book I’ve been meaning to get to… is to discover that there’s a sequel coming out! Which is how I finally came to read Fiona Cummins’ Rattle and its sequel The Collector in such quick succession. Jakey escaped with his life and moved to a new town. His rescue was a miracle but his parents know that the Collector is still out there, watching, waiting . . .
Clara, the girl he left behind, dreams of being found. Her mother is falling apart but she will not give up hope. The Collector has found an apprentice to take over his family’s legacy. But he can’t forget the one who got away and the detective who destroyed his dreams. Fiona Cummins relocates the action from London to the East Coast of England in The Collector. It follows Jakey and his family as they try a fresh start in a new home, although Jakey is unsettled and senses that the Collector is never far away. And he’d be right; the Collector’s licking his wounds but he’s also considering starting over. When DS Etta Fitzroy is drawn East too, with a new partner in tow, in order to follow up a lead in her missing person’s case, all the players are in position and the macabre games can recommence. And I mean macabre. This seemed altogether darker and more disturbing than Rattle, not least because we see how the Collector sets up his new lair. Cesca Major’s debut historical novel The Silent Hours takes as its inspiration a truly shocking event which happened during World War II, the anniversary of which fell on 10th June. Tristin, a nine-year-old boy, whose family moves from Paris to settle in a village that is seemingly untouched by war. Having roamed across its summer meadows with peach juice dribbling down chins, while exploring grief in her evocative debut novel The Night Rainbow, Claire King returns to Southern France for her second, Everything Love Is. The novel shifts between a floating community on the slow-moving waterways just outside Toulouse and into the city itself where the political situation seems altogether more fluid and fast-moving. And, as you can probably deduce, this time Claire King turns her attention towards love. Moored on his beloved houseboat at the edge of Toulouse, Baptiste Molino helps his clients navigate the waters of contentment, yet remains careful never to make waves of his own. But between Sophie, the young waitress in his local bar who believes it is time for Baptiste to rediscover passion, and his elegant, enigmatic new client Amandine Rousseau, this fragile status quo is now at risk. When the rising tensions on the city streets cause his mysterious past to catch up with him, Baptiste finds himself torn between finally pursuing his own happiness and safeguarding that of the one he loves. Born on a train to a mother he never knew and raised by adoptive parents in their countryside cottage, Baptiste lives a simple, pared-down existence on the houseboat, Candide. Although his work involves helping others to find out what brings them contentment, he pays little heed to his own happiness, convinced instead he has all he can hope for and considering that to be enough. He’s careful not to get too attached to people although inevitably he forms some connections among the community on the canal. There is a sense that he needs to feel as if he could cast off at a moment’s notice. The publication date for Judith Kinghorn’s fourth novel, The Echo of Twilight, is fast approaching early next month but, given the season, now seems the perfect time to offer someone a copy of her previous novel, The Snow Globe. Give The Snow Globe a gentle shake and you’ll find a father falling off his pedestal, a mother forced to reassess her life, both past and future, and a daughter on the cusp of her adult life with romance and independence beckoning, becoming more aware of the real world outside her sheltered childhood home and the houseful of secrets that same haven contains. As the seasons unfold in the new year, and Daisy moves to London, desires, fortunes, and loyalties will shift during this tumultuous time after the Great War. The Forbes family and those who serve them will follow their hearts down unexpected paths that always return to where they began…Eden Hall. 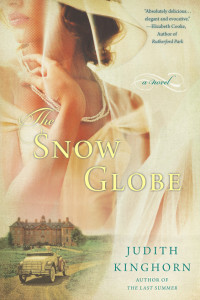 Set in an English country house in the 1920s, The Snow Globe is, as always with Judith Kinghorn’s novels, a pleasure to read: her beautiful writing coaxes you through a story filled with period detail, lush description and a whole cast of fully-formed characters. Just as you do with Robert Altman’s inclusive camerawork in Gosford Park, you’ll soon feel caught up in daily life at Eden Hall, thanks to Judith’s intimate writing style, drawing you into the book’s world and the heads of her characters. I’ll leave it up to you to decide whether you’re more at home above or below stairs.